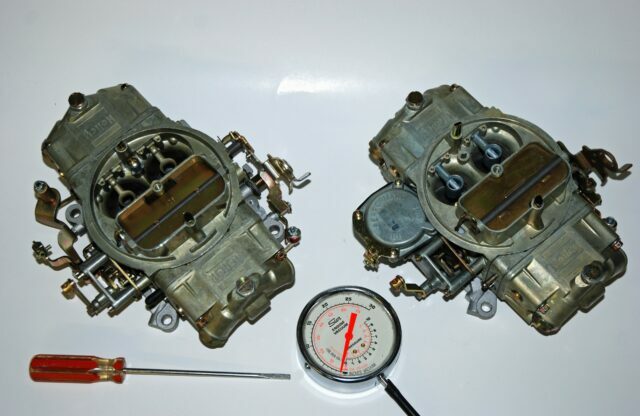 Click Here to Begin In the high-performance world, Holley carburetors are likely the most common high-performance fuel mixing devices on the planet. Period. They came equipped as standard equipment on a multitude of high-performance cars from the Sixties and early Seventies. And this doesn’t take into account the plethora of hot rods and racecars retrofitted with Holleys over the years. Given the consistent Detroit use along with the sheer numbers of carburetors retrofitted over the past decades, you know that they obviously work (and rather well). If there is a little fly in the ointment, it actually involves setting up the idle. Given the ease of adjustment in a Holley, some folks get it totally wrong, and from there, discount the entire carburetor. So which way do you turn the screws, and which screws do you turn? The basic idle setup of a Holley isn’t difficult. Everything can be accomplished at home, with (extremely) simple hand tools. For a closer look, check out the following. We’re using a very common vacuum secondary 3310 Holley along with a 4781 double pumper as the examples (and everything shown here applies to factory installed Holleys too). 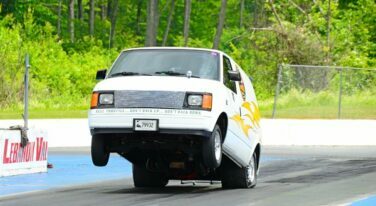 Please note that the latest Holley XP carbs incorporate an idle bypass arrangement, and adjustment is a bit different. For more on those carbs, point your browser HERE! In the high-performance world, Holley carburetors are likely the most common high-performance fuel mixing devices on the planet. Period. They came equipped as standard equipment on a multitude of high-performance cars from the Sixties and early Seventies. And this doesn’t take into account the plethora of hot rods and racecars retrofitted with Holleys over the years. Given the consistent Detroit use along with the sheer numbers of carburetors retrofitted over the past decades, you know that they obviously work (and rather well). If there is a little fly in the ointment, it actually involves setting up the idle. Given the ease of adjustment in a Holley, some folks get it totally wrong, and from there, discount the entire carburetor. So which way do you turn the screws, and which screws do you turn? The basic idle setup of a Holley isn’t difficult. Everything can be accomplished at home, with (extremely) simple hand tools. For a closer look, check out the following. We’re using a very common vacuum secondary 3310 Holley along with a 4781 double pumper as the examples (and everything shown here applies to factory installed Holleys too). Please note that the latest Holley XP carbs incorporate an idle bypass arrangement, and adjustment is a bit different. For more on those carbs, point your browser HERE! The first step is to deal with secondary throttle stop. What’s that? Allow us to explain: If your car has a camshaft with considerable duration (and as a result, a very lumpy idle), you’ll find the idle mixture screws tend to be unresponsive. There's an easy fix: Adjust the secondary throttle stop screw. 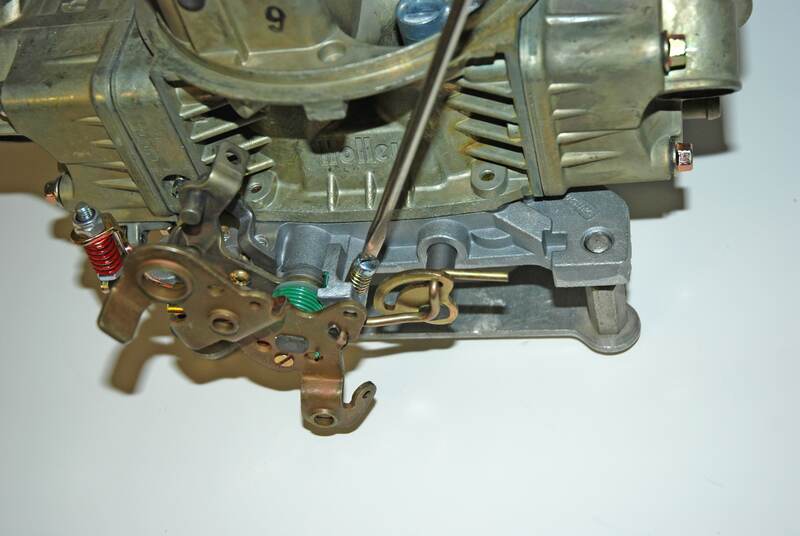 Holley four barrels have a small setscrew located beside the passenger side throttle bore shaft bore (on the base plate of the carburetor, so you’ll have to flip it over). 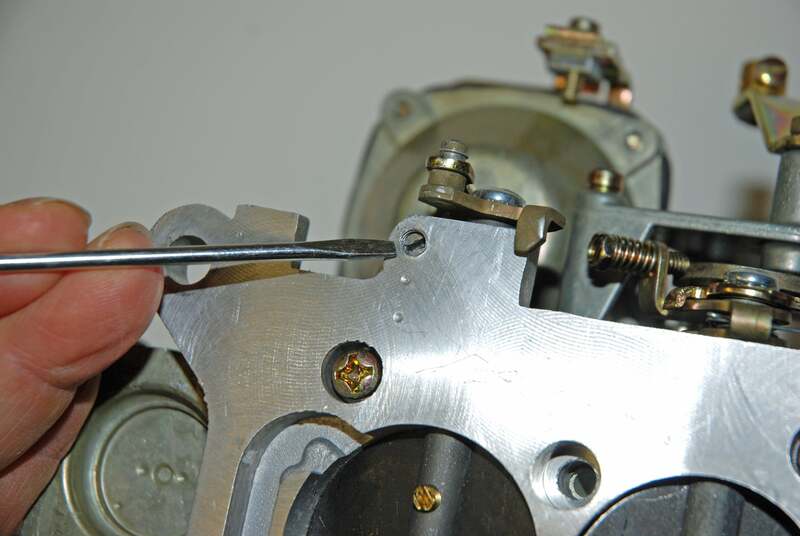 By turning the screw clockwise approximately 1-1/2 turns, the throttle blade on the secondary will open slightly. 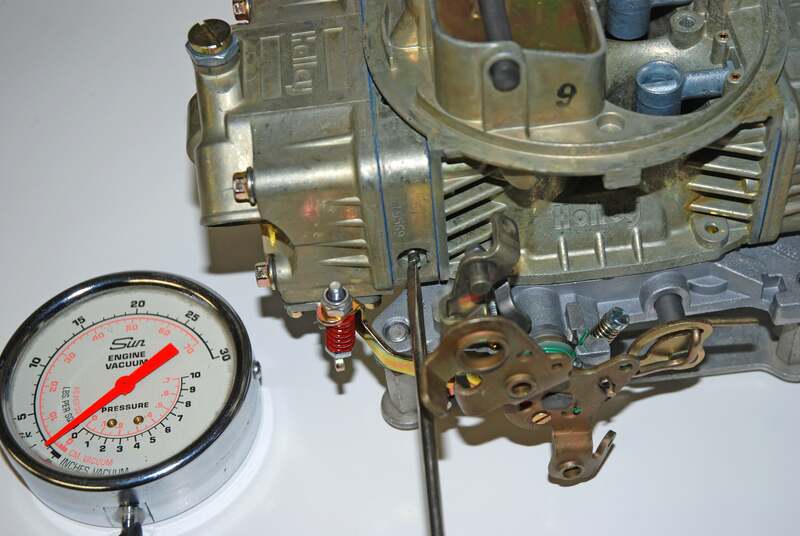 This results in a rather large amount of airflow through the carburetor, without increasing the "window" seen by the idle transfer slot. At this time, the primary throttle blades can be closed, which tends to enhance the sensitivity of the idle mixture control. 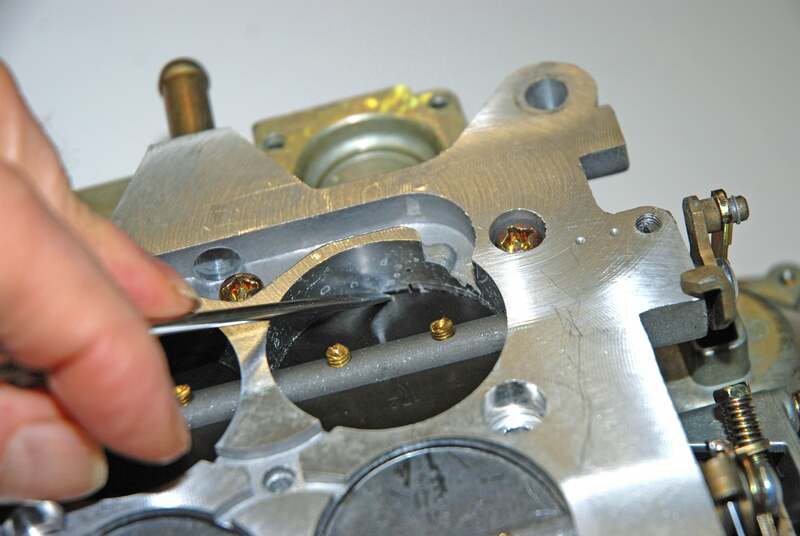 Most carburetors will have the butterflies adjusted with a small length (approximately 0.020-inch – appearing as a square) of the idle transfer slot visible below the bottom edge of the butterflies. If the secondary transfer slots (as shown in the second photo) are uncovered excessively, the engine can develop an undesirable hesitation when the butterflies are suddenly opened. Keep that in mind when adjusting the secondary stop. When you have adjustment sensitivity on the idle mixture screws, you can then balance the idle mixture. 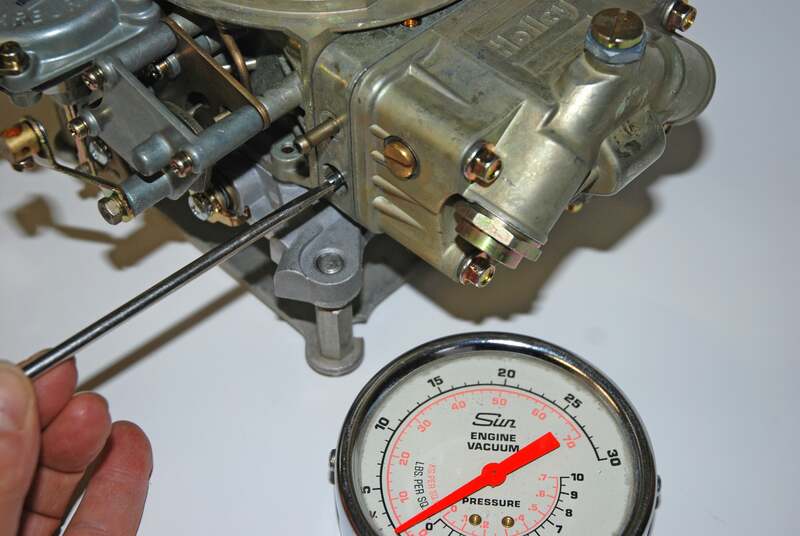 To accomplish this, install a vacuum gauge on the engine (it needs to read conventional manifold vacuum). Pick one idle mixture screw and call it "number 1”. 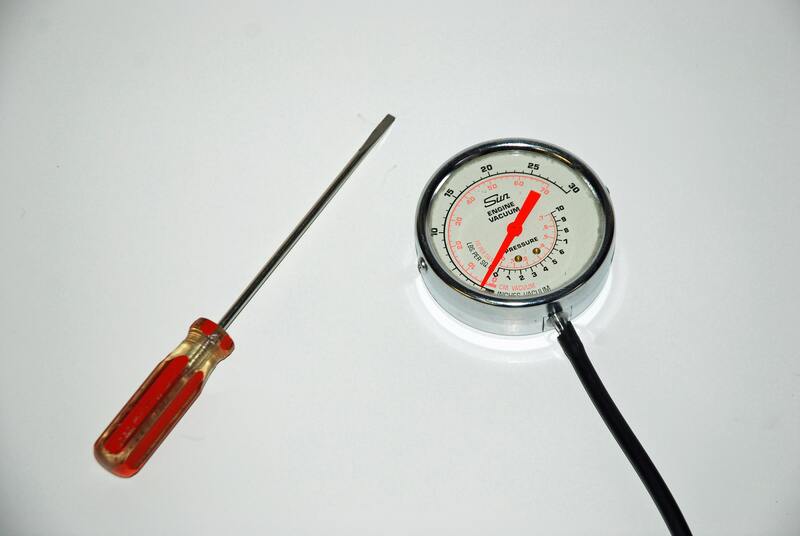 Set this screw until you reach the highest manifold reading on the gauge. Then proceed to the second mixture screw and set it to the highest reading. Go back and repeat the process, fine tuning the idle mixture and repeat the process for a third and final time. If your aftermarket Holley is equipped with four-corner idle circuits such as the 4781 shown in the photo, set the front first, then set the rear. Recheck the front idle after the rear setting has been confirmed. Reduce the idle speed and repeat the process, perhaps several times, until the engine idles at the desired engine speed. If the carburetor is new or freshly rebuilt, turn the idle mixture screws all the way in, and then back them out in unison. For the initial adjustment, all screws should be within 1/4-turn of each other, although you may have to turn the primary screws out an additional 1-/8 to 1/4 turn. I suppose a Barry Grant Demon would set the same way? I fell victim to this, a long time ago. I wound up drilling the smallest “recommended” holes in the throttle plate, one at a time. Largely solved the problem. Put the Primary throttle plate between the idle port and the transfer slot. But in-elegant and probably unnecessary, if I had just addressed the 2dry throttle plate adj, first. 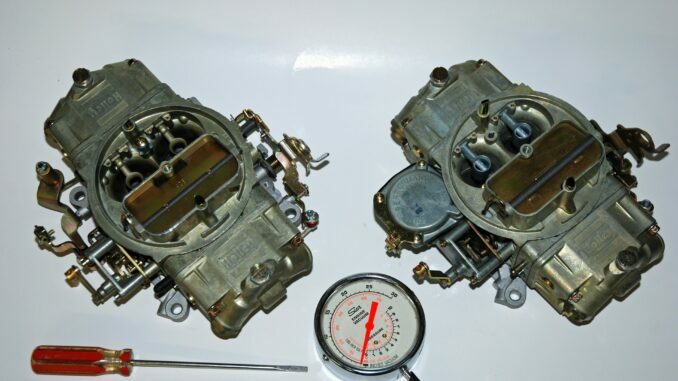 The carb was a 650 VS on a mildly breathed upon 360 in a Ramcharger, very tight converter. Live and learn, however belatedly. I learned a few years ago that Holley’s idle mixture fuel in part is delivered thru the secondary circuit.I have run holleys on my performance engines for years without giving it a thought until working on a old 1850 for my wrecker.and haveing trouble getting mixture right.like your article states many oem holleys were used and not just on performance cars. a 57 mercury with a 312 I had as a kid comes to mind. I am sure there were many others. that being said. 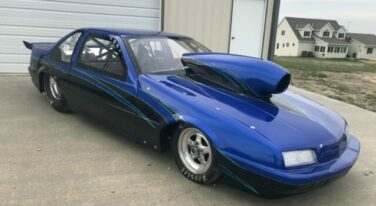 assume one of those oem land yacht’s were to be sold to a little old lady that never even opened the primaries all the way, much less the secondaries, what would the gas in the secondary fuel bowl look like after about a year if a little were not consumed at a stop light. 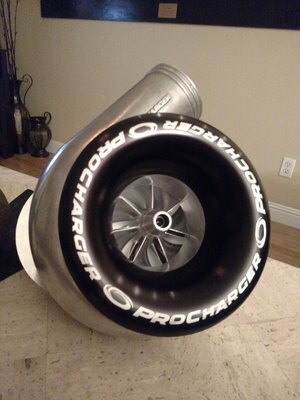 Procharger F1X-12R NEW! With Bell! Sell Fast! More! !